220A, WITH FANUC Oi-TC CONTROL, 6” CHUCK, 5C & 16C COLLET NOSE, S/N L220-2858. 2000 DAEWOO LYNX 200B, CNC TURING CENTER, WITH FANUC 21-IT CONTROL, 8” CHUCK, 5C COLLET NOSE, S/N L200-1751. 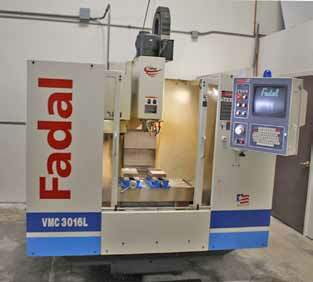 2001 FADAL VMC 3016L CNC WITH CT-40, 20 ATC, 7500 RPM, S/N: 1200121875. RICHMILL 4th AXIS ROTARY TABLE. CT-40 TOOL HOLDERS, SPRING COLLETS, 5C & 16C COLLETS, TOOLING VISES AND ETC. GRIZZLY 6 x 12 SURFACE GRINDER. WILTON 3600, 16” HORIZONTAL BAND SAW.